I have a thing for understatement. Maybe it’s borne out of a latent muscle car fandom—you know, look harmless but pack a whopping engine—whatever the case, I’ll almost always take the well-tailored q-ship over a flashier equivalent, performance-wise. Besides, cars with understated styling tend to age better. They’re less tethered to design trends and fads of a particular period, but instead rely more on proportion and overall shape for their appeal. 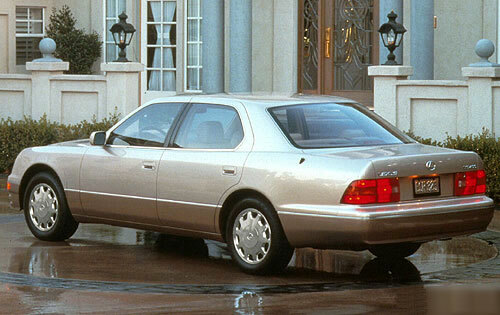 The car under consideration today, the ’95-’97 Lexus LS400, is a case study in how careful design craft and attention to detail can produce an unsung paragon of understatement. Faced with the prospect of refreshing the styling of their successful foray into the luxury market, Lexus chose to retain many of the original LS400‘s overall themes, but discarded the flabby, soap-like proportions in favor of a tauter, more energetic stance. That said, the subdued nature of the update means you really do have to ponder the lines for a while to appreciate the harmonious convergence of subtle details. But the car rewards the work with pleasing effects like the beautifully-executed character lines on the hood, the perfect weight of the C-pillar and the fluid curve of the beltline. The more you consider it, the more the fine-tuning of the car’s design just comes together. 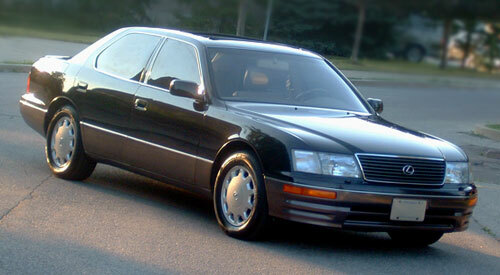 Where the original LS400 seemed to be sagging under its own weight, the update looks fleet and effortless. Underscoring the impact of the nip-and-tuck job are a couple of engineering details. First, the more aerodynamic presence of the LS400 isn’t mere posturing—the wind tunnel had a large hand in helping define many of the car’s contours, bringing the drag coefficient down to a very impressive 0.28. And more significantly, with the update Lexus managed to excise over 200 lbs from the car, trimming the full-size luxury sedan down to a gloriously lightweight 3600 lbs. There’s little I admire more than an automaker exhibiting that kind of devotion to stemming the ballooning weight of cars across the automotive spectrum, and the high end in particular, where nowadays the going weight of a car in the LS400’s class is well north of 4000 lbs. Just being aware of those under-the-skin properties—the actual slipperiness of the body as well as its admirably low weight—reinforces my regard for its design. I have two words for you: more cowbell. Totally got the SNL skit reference. Just couldn’t connect it to the post… But maybe John was being intentionally random? Then again, I just crapped out the SU carb post, so I may not be thinking straight, either… Oi.